Passed away peacefully on 21st March 2019 at the age of 95. Beloved wife of Oscar (dec). 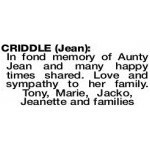 Cherished mother of Lyn (dec), Kay, Christine and Robyn. Loved mother-in-law of Bruce, Mike (dec), Bob and Geoff. 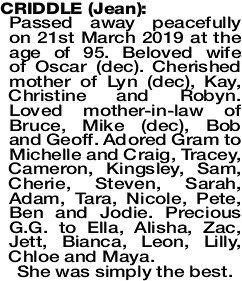 Adored Gram to Michelle and Craig, Tracey, Cameron, Kingsley, Sam, Cherie, Steven, Sarah, Adam, Tara, Nicole, Pete, Ben and Jodie. Precious G.G. to Ella, Alisha, Zac, Jett, Bianca, Leon, Lilly, Chloe and Maya. 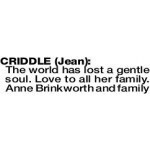 The Funeral Service to celebrate the life of Mrs Mary Virginia (Jean) Criddle will be held at PINNAROO Valley Memorial Park East Chapel, Whitfords Ave, Padbury for a Cremation Service on FRIDAY (29.3.2019) at 9.30am. Vigil Prayers and Rosary will be recited at Purslowe Chippers Funeral Home, 15 Scarborough Beach Road, North Perth on WEDNESDAY Evening (27.3.2019) at 6.30pm.